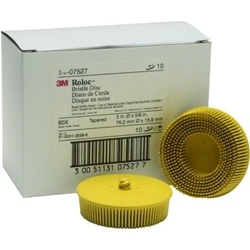 Scotch-Brite Roloc Bristle Disc 3" Grade 80 BOWES 3M 7527. Disc is a molded, abrasive filled bristle disc instead of wire brushes for automotive use on aluminum and metal. Use for deburring, blending, finishing, polishing, cleaning and for coating, defect, scratch and rust removal.